A unique installation that brings the voices of children and young people to the heart of the United Nations General Assembly was unveiled today by UNICEF Goodwill Ambassador David Beckham, United Nations Secretary-General Ban Ki-moon, UNICEF Executive Director Anthony Lake, and two young people from UNICEF Voices of Youth initiative. 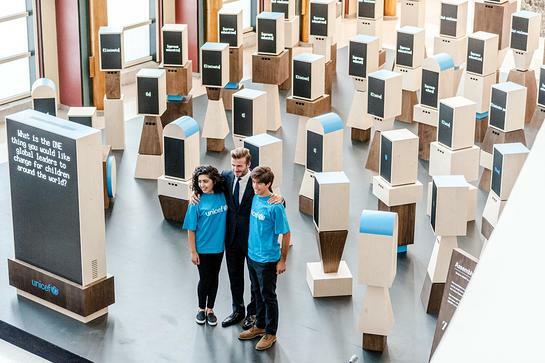 As the UN prepares to adopt the Sustainable Development Goals, the Assembly of Youth, a digital installation created for UNICEF by Google, harnesses mobile technology and social media to deliver personal messages from children and young people across the globe directly to world leaders. The messages highlight the challenges they face in their homes and communities – including extreme poverty, inequality, violence, deadly disease and conflict – and express their hopes for the future. At the unveiling, David Beckham urged world leaders to listen to these messages – and to take action – to transform the lives of millions of children by putting the most disadvantaged children and young people at the centre of all decisions and investments in the new 15-year development agenda. Earlier this year, Beckham marked his 10th year as a UNICEF Goodwill Ambassador with the launch of 7: The David Beckham UNICEF Fund to use his powerful voice, influence and connections to raise vital funds, fight inequality, and rally for lasting positive change for the world’s most vulnerable children. The Assembly of Youth is the latest initiative from UNICEF and David Beckham that brings the voices of children and young people to a global audience with the aim of inspiring action. Despite the progress made toward realizing the Millennium Development Goals, millions of children are still left behind. Nearly 6 million children under the age of five still die every year from mostly preventable causes. More than 120 million children and adolescents are still not in school and many millions more are not receiving a quality education. The Sustainable Development Goals present a critical opportunity to extend progress to every child, but only if the world makes reaching the most disadvantaged and vulnerable children a policy and political priority. Data displayed in the installation is drawn from U-Report, a free SMS-based system that allows young people to speak out on the issues they face and what is happening in their communities. Data is also derived from outreach to children and young people across UNICEF social media channels. Share your views and hopes for children across the world here, and your voice will be added to the installation, to remind world leaders that children must be at the heart of the new global agenda.